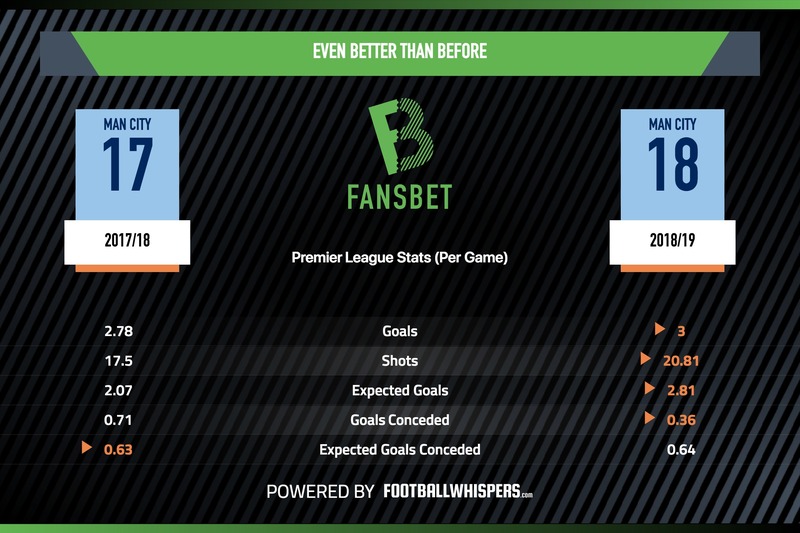 Can Manchester City win the Premier League-Champions League double? They're probably the best team in Europe, but their manager is cautious about their chances. Manchester City have scored more goals than the bottom four clubs in the Premier League combined, that’s just how good they are. Their goal difference is +29 after just 11 games, an average of outscoring their opponents by over 2.5 goals per match. Can they do what no English club has done in a decade and win the league and Champions League double? Our friends at Football Whispers are here to consider it. If you thought Manchester City were good last year, this year they might be even better. Given that the Centurions broke the Premier League points record last season, that’s a scary thought. They’ve nudged up the number of shots they take, goals they score, and big chances they create per game compared to last season. On average, they’re winning back the ball higher up the pitch and – if they do lose the ball without scoring – it’s closer to the opponent’s goal when they do so. On top of this, they’ve already faced three of their fellow Top Six clubs, all of those matches away from home, and taken seven points. It’s hard to see them being stopped. Despite this, Pep Guardiola still believes that they lack a certain ‘something special’ that’s needed to win the Champions League. Although it might sound ridiculous to suggest that a team as good as City might struggle to win the Champions League, he might have a point. There’s something about the meticulous planning involved in Guardiola’s teams City that arguably makes them far more suited for league competitions than cups. Often, they have enough quality to overcome opposition, but with the fairly rigid framework that the Catalan puts in place, it doesn’t feel like there’s much room for individual moments of magic which so many one-off cup competition victories rely on. Barcelona had Lionel Messi, who could always produce a moment of magic, and at Bayern Munich Guardiola was forced to adapt his core philosophies to use the Bavarian club’s individual superstars like Franck Ribery and Arjen Robben. While City have some magnificent players, none of them are the kind of individual talents that Guardiola has had at previous clubs. While this may make them easier to mould into a killer system in the league, it could well be the case that they lack the ‘something special’ that’s needed to win the most difficult club cup competition on planet. Manchester City are truly something special, though. Expected goals is a statistic which measures the quality of chances that a team creates. 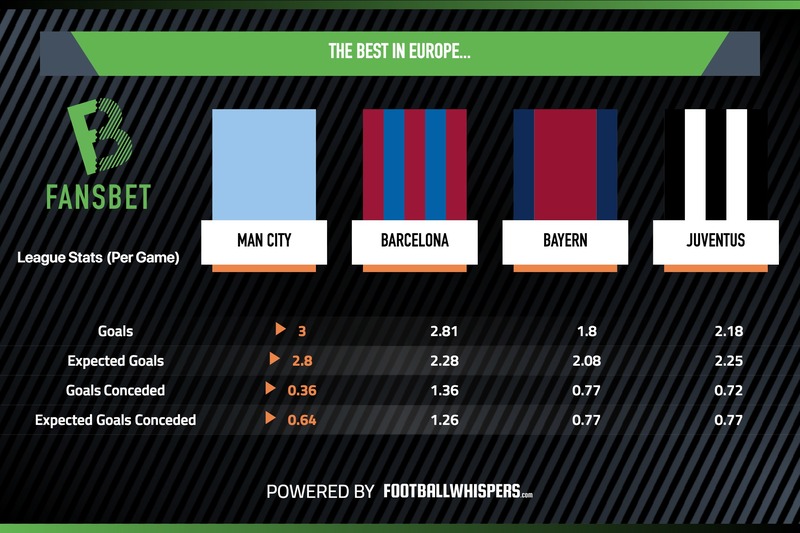 Manchester City lead Europe in expected goals per game (2.8); Chelsea the nearest team (2.48), with other European giants around half an expected goal per game away (Barcelona 2.28, Bayern Munich 2.08). And then they also lead Europe for the fewest amount of expected goals conceded per game as well. If the Champions League was true to its name and followed a normal league format, then City would almost certainly win it, but that’s the magic of cup competitions – the drama. “To win this competition it’s not enough just to have desire or wanting to win,” Guardiola also said last month. “You have to have many circumstances, have experience and still we don’t have enough. Guardiola clearly doesn’t at the moment, but he may just be managing expectations, particularly with such a young squad who don’t have the kind of Champions League experience that he says is needed in the competition. The Catalan has only won the competition twice, after all, despite being in charge of one of the best teams in Europe throughout his near decade-long managerial career. But this team could be different. No matter how skilful his teams have been in the past, never has Guardiola been able to shape a team in the way he has at Manchester City, and to lead Europe in attack and defence in a league as competitive as the Premier League is a feat to be scared of. Even if their manager doesn’t seem like he believes it, Manchester City can do the league and Champions League double this season. They’re just that good.